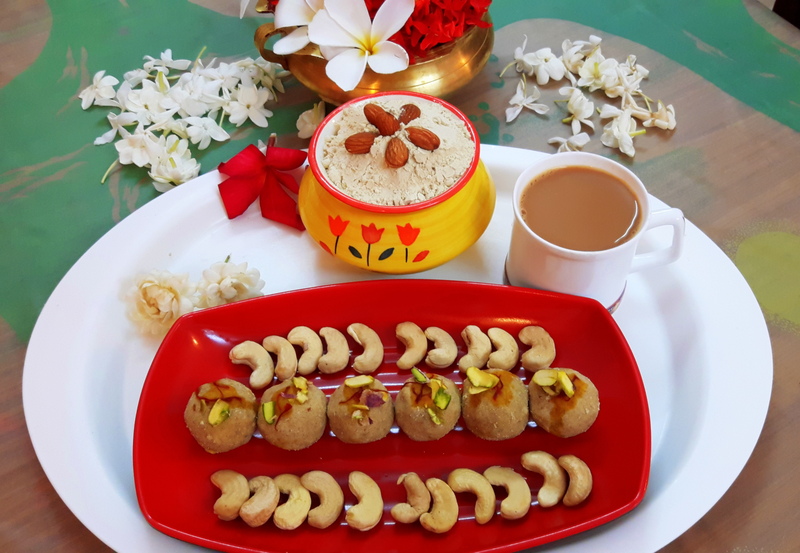 Holi is at our doorstep: come and get ready to prepare traditional sweets and Namkeen. 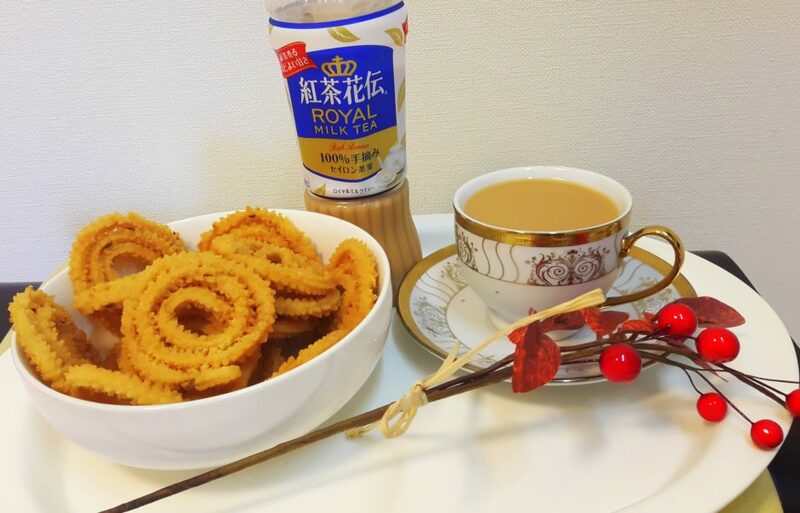 Murukku (chakli) is one of the oldest and traditional snacks, and all time favorite, especially in south India, now a day’s all over India, even in Japan too. 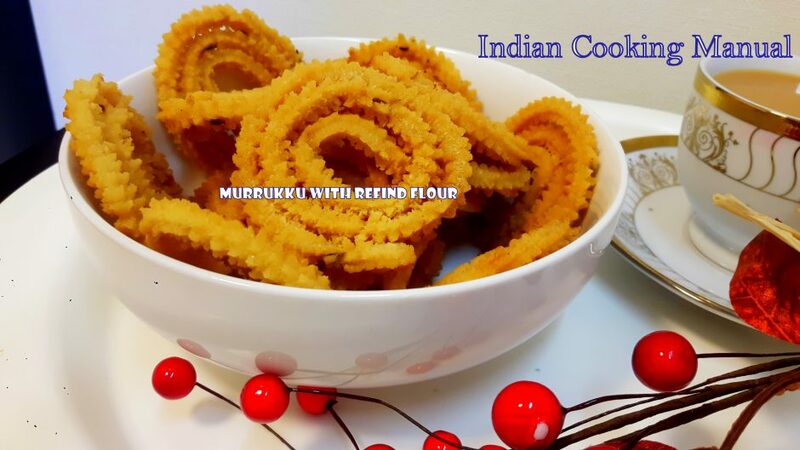 There are many ways to prepare Murukku, but here one of my friends introduced me this recipe with very few basic ingredients, refined flour and split black gram. 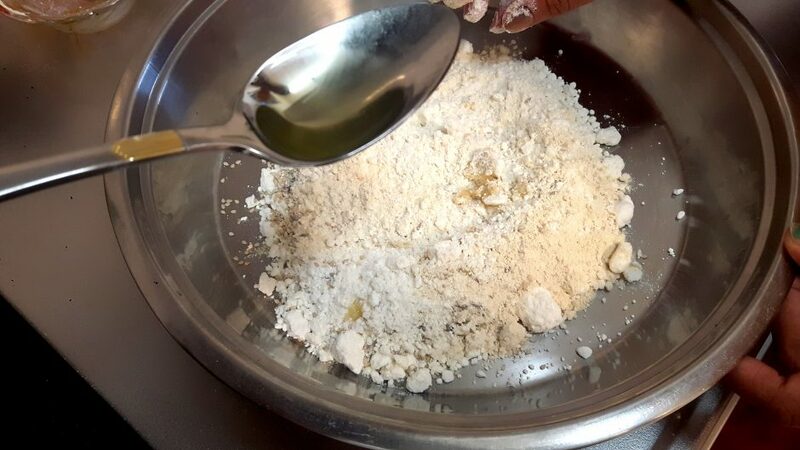 Olive oil/cooking oil: 1 tablespoon for moin. 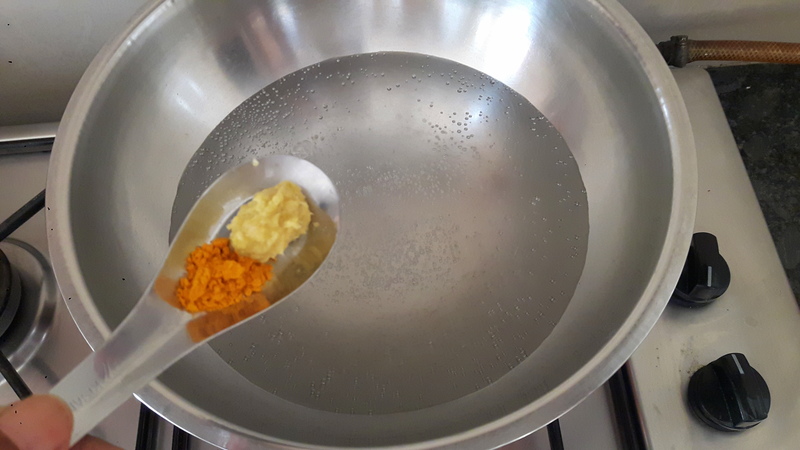 Take a separator (pot of the size which can come in the pressure cooker) of pressure cooker. 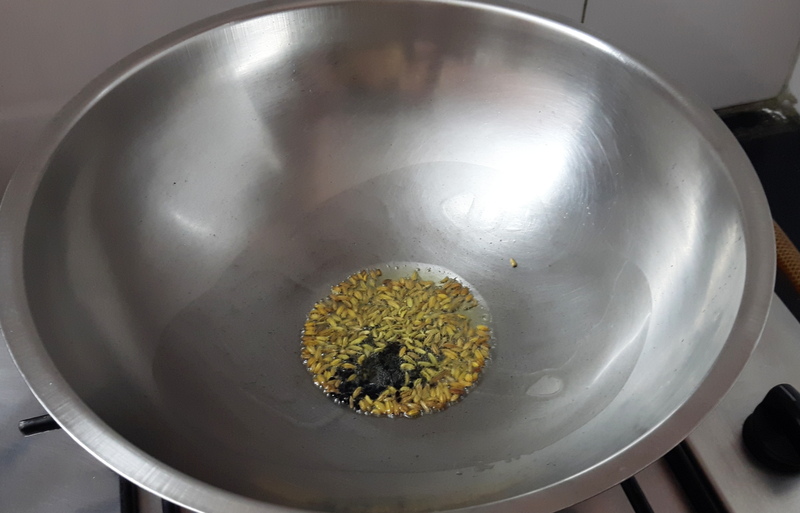 Put one glass of water in pressure cooker, and place the separator into pressure cooker with Maida on small stand (grid). Pressure cook (steam cook) for 10 minutes and allow cooling. Take separator out from the cooker. Keep aside. 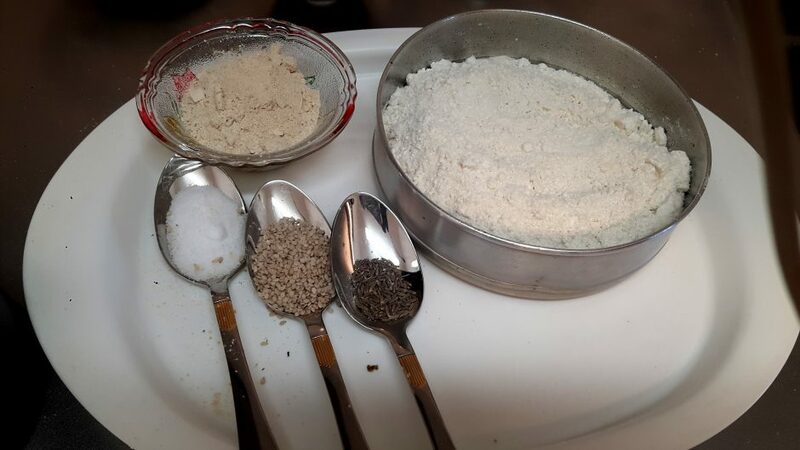 Dry roast urad dal, grind to fine powder. Keep aside. 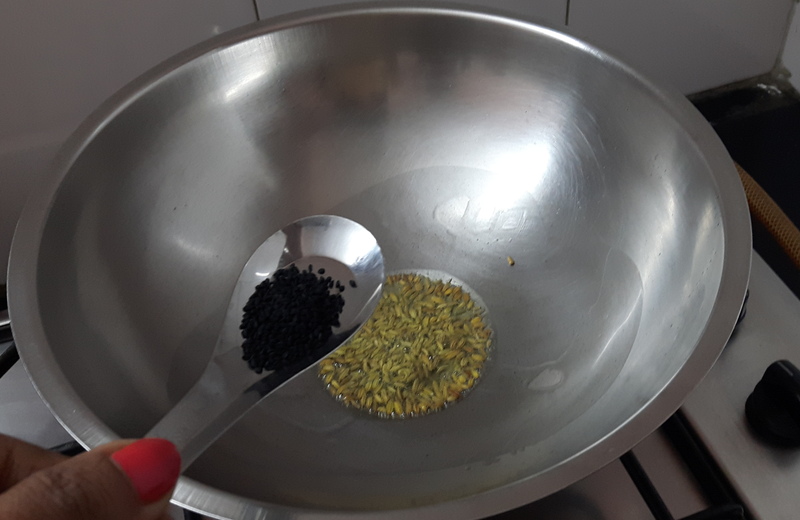 Take a wide vessel; pour steamed refined flour, powdered urad dal, salt, Sesame seed, cumin and oil (moin). Mix well by rubbing between palms. 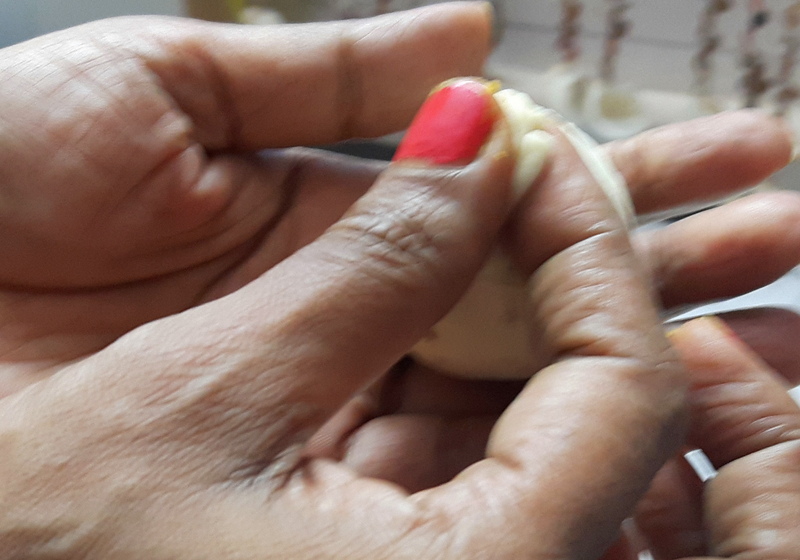 Add water in small quantity and knead them. if required, put some more water till the dough becomes soft. 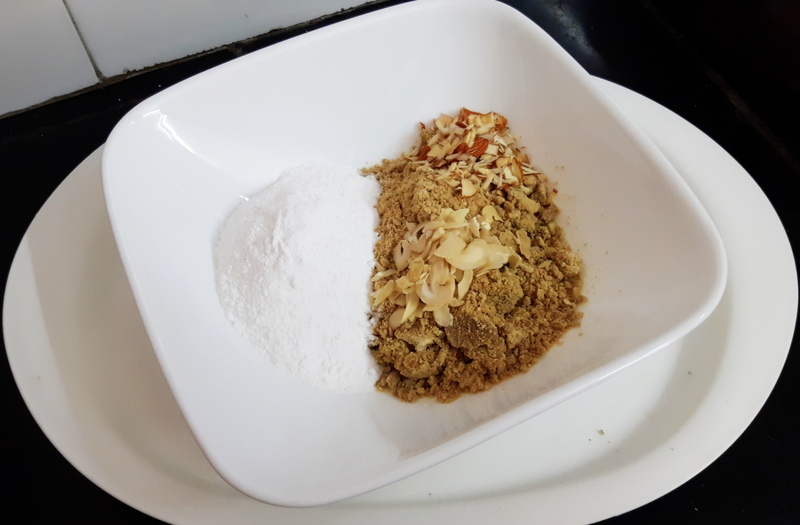 (The dough can be made in food processor also). 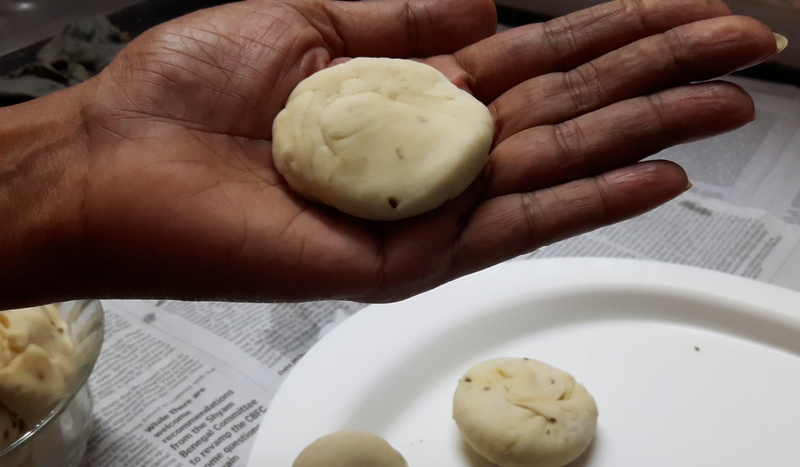 Divide the dough into 2-3 equal parts and roll each part into a cylindrical shape, take chakli maker, apply oil inside. 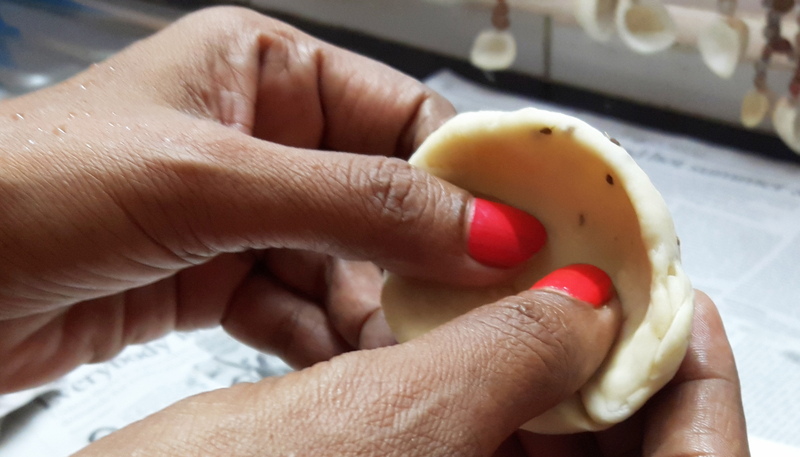 Fill the maker with dough. 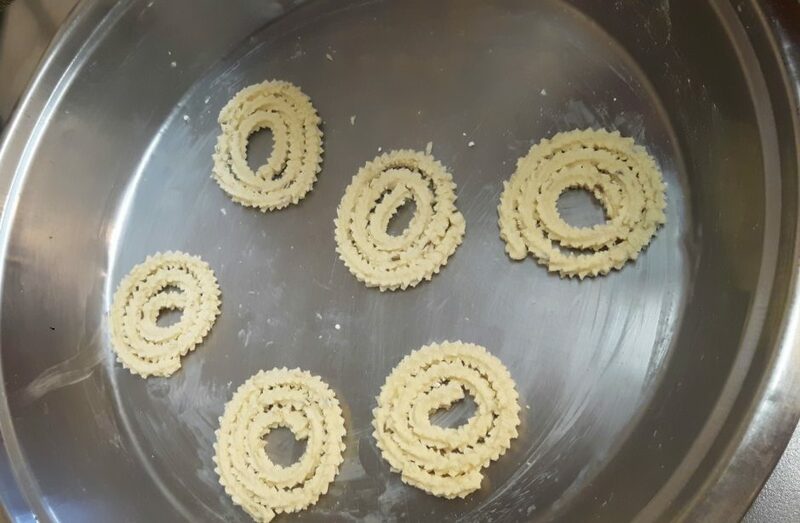 Take a plastic sheet; give the round shape of chakli on the sheet, all chakli is to be prepared on this sheet, as in photo. 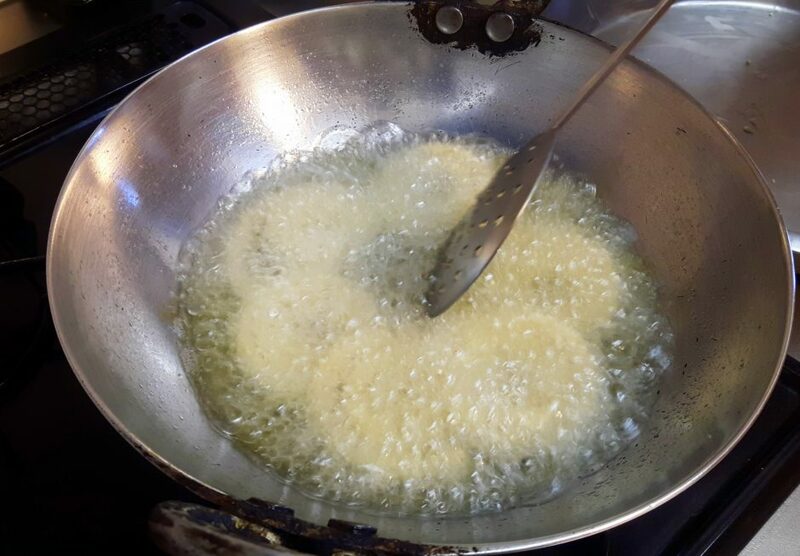 Heat oil in a fry pan on medium heat (to check if oil is ready put a little piece of dough in the oil, if it comes up slowly means it is ready, if doesn’t wait for couple of minutes and test again). 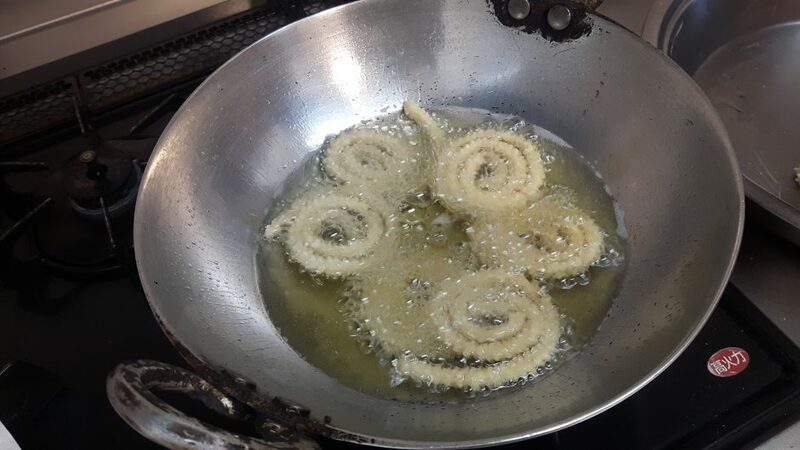 Now deep fry the chakli into the hot oil (as shown in photo) on medium heat, after they start to come up slowly, turn over with tongs. 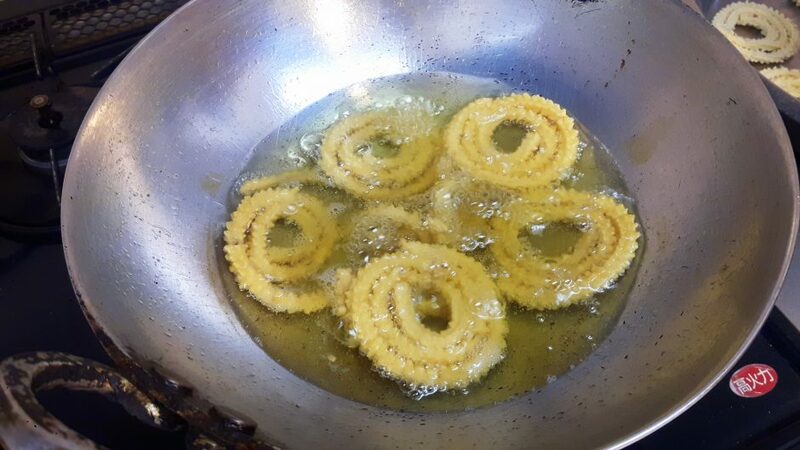 Fry till it becomes light brown in color, remove chakli from the oil; wait for a minute to get the oil hot again. Repeat this till all chaklis are done. 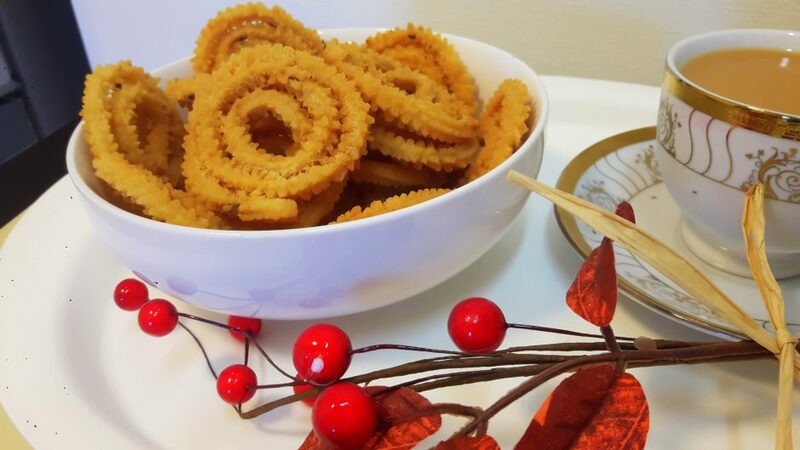 Now, chakli is ready to serve. Store it in air-tight container. I had been on trip to London. My daughter in law ordered to home delivery for lunch to an Italian restaurant. 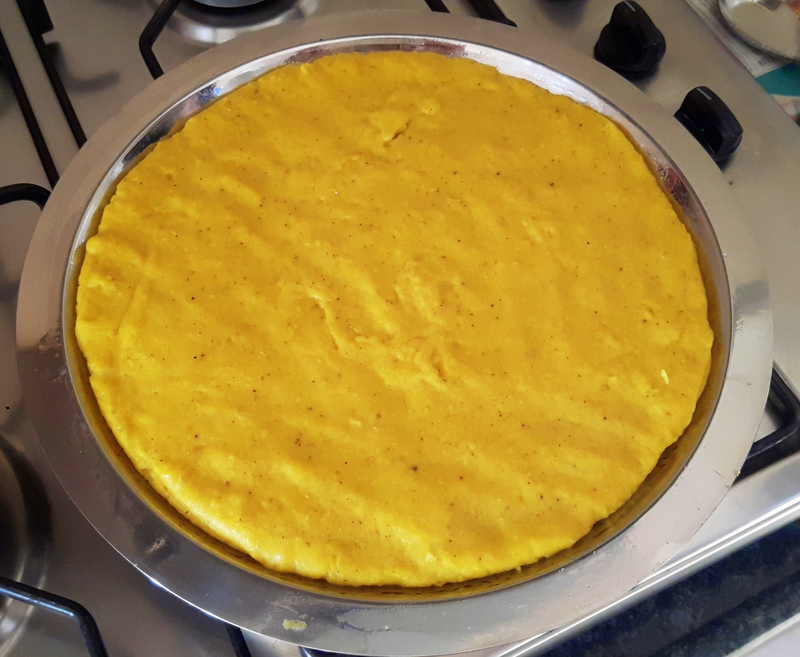 I tasted one of the dishes named ‘Polenta’. 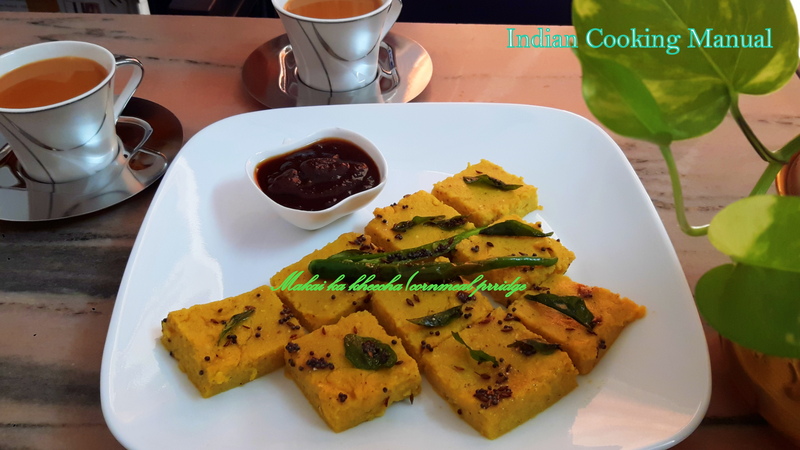 This dish made from cornmeal and taste is awesome. 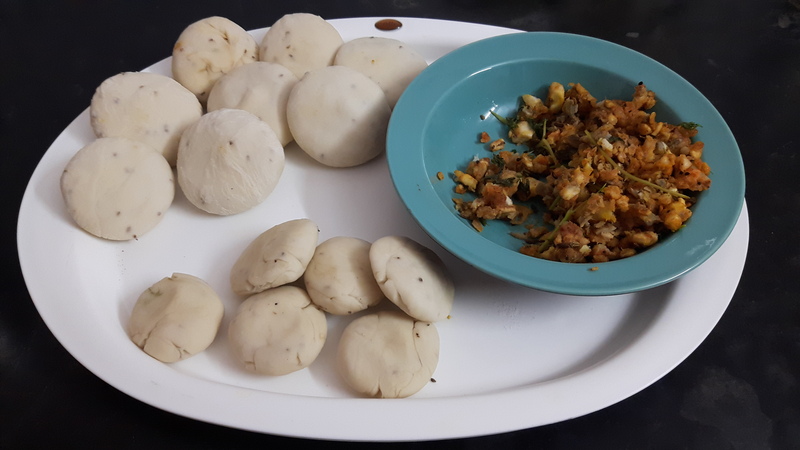 That moment I recalled my childhood day, actually it was resemble to our Indian recipe ‘Makai ka kheecha’. 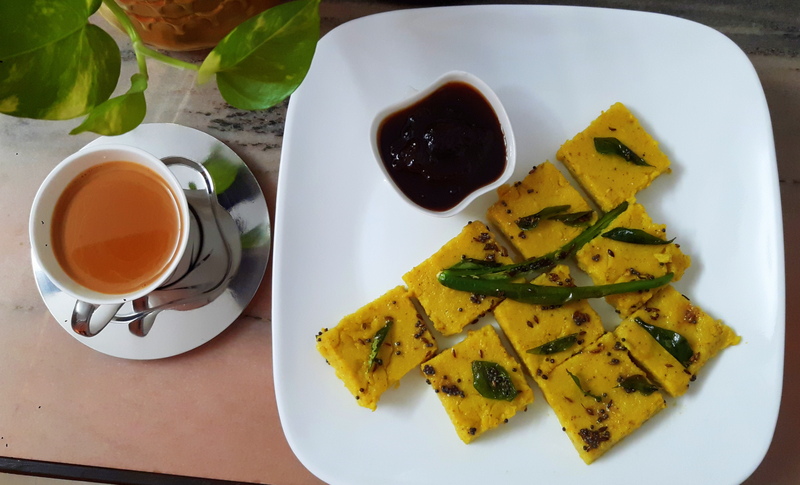 The next morning I prepared the dish with some variation as ‘Makai ka kheecha’ traditionally served as ‘Halwa or Porridge’, but in my recipe I set this porridge in a greased plate and after cooling, cut into square and rectangle. 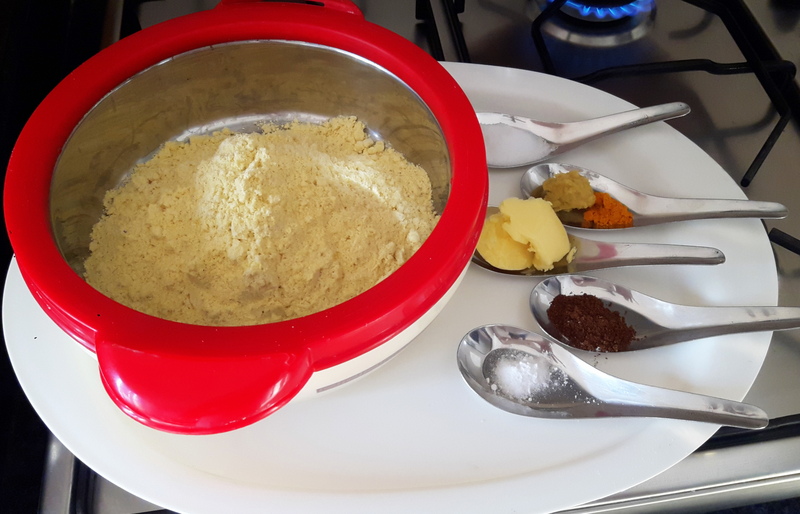 Many decades ago; this cornmeal recipe was traditionally associated with lower class, poor, rural and peasant people for their everyday nutrition. 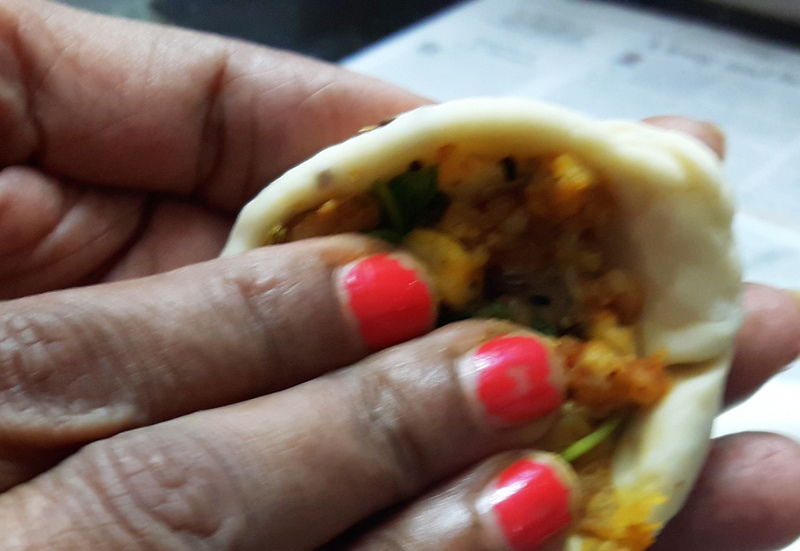 But now for couple of decades it has become popular in all segment of Indian society and available in the top restaurants too. 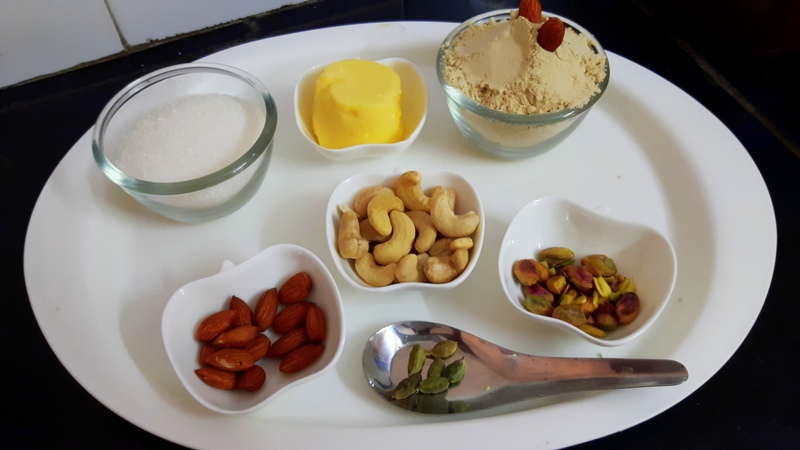 So, plan to prepare the recipe and enjoy the recipe…you may serve as porridge or make slice as per your choice but it is important to take care of the texture and consistency. 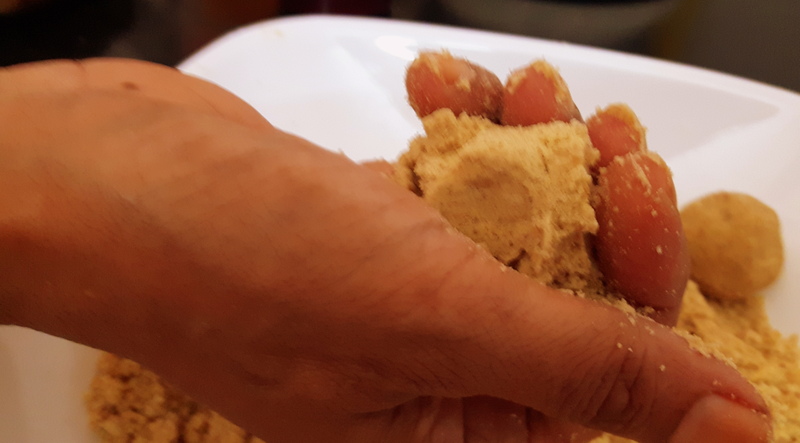 Note: Traditionally it is made from yellow cornmeal. 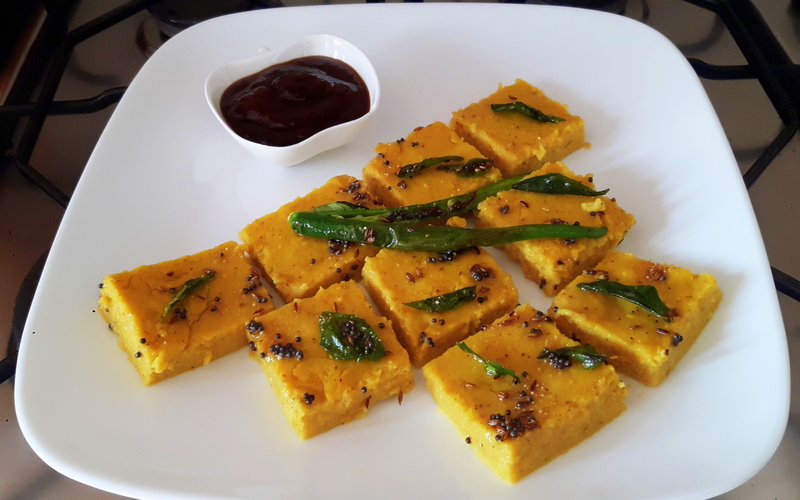 Makai ka Aata (cornmeal): 100 gm. 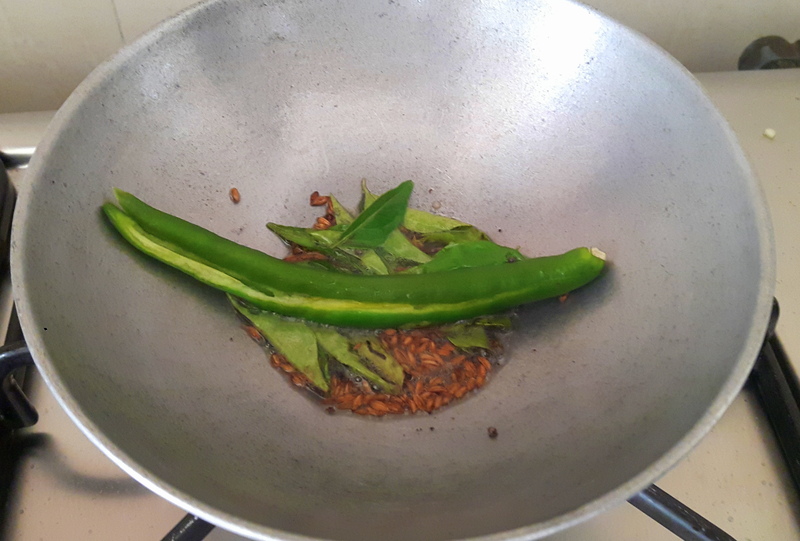 Chop the coriander leaves, slit green chili keep aside. Grease a plate with ghee/oil, keep aside. 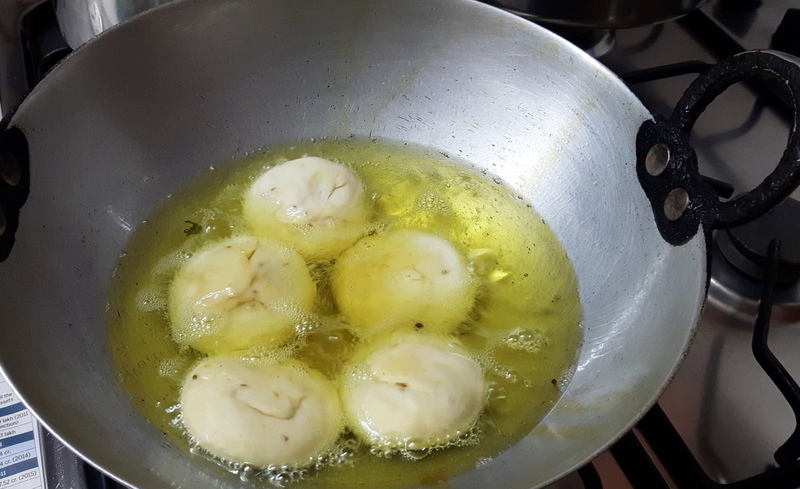 Boil water in a thick bottom pot; bring the water to boil, add salt and 1 tablespoon of butter in it, add cumin powder, garlic paste and meetha soda too. 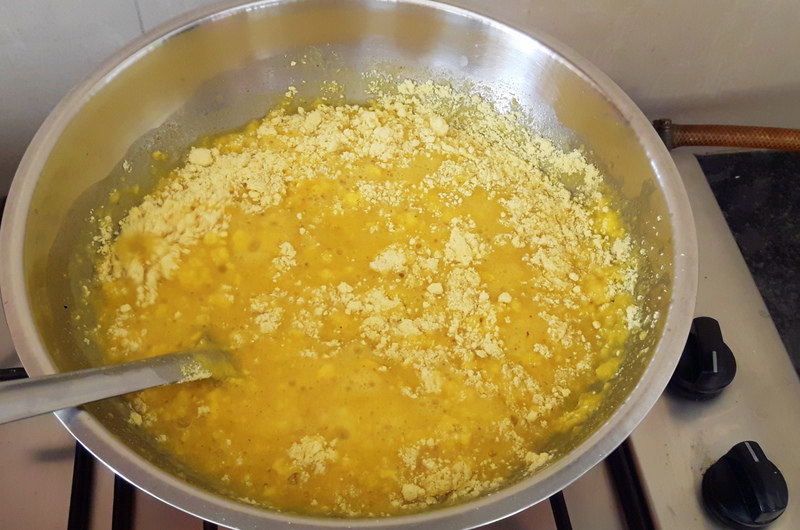 Add cornmeal into the boiling water in a steady manner: continue stirring until become thick, cover the pot and cook on lower flame for 10-12 minutes, add remains butter. 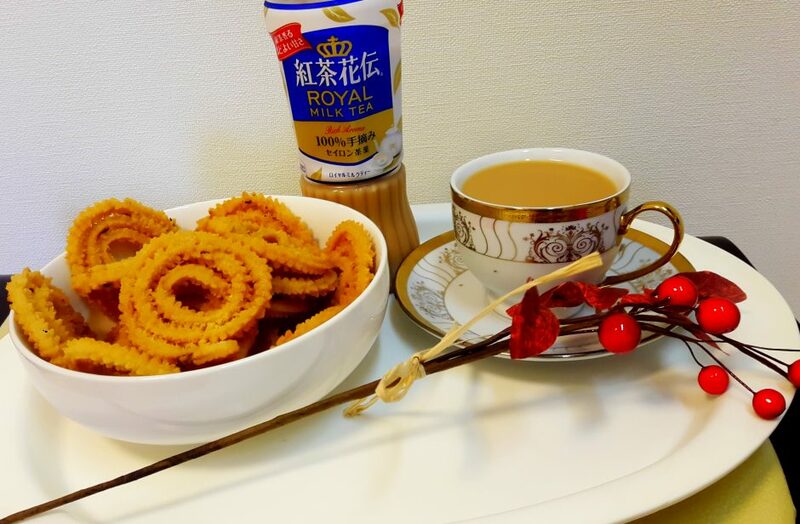 It is necessary stir occasionally to cook evenly and prevent settling down on the bottom. 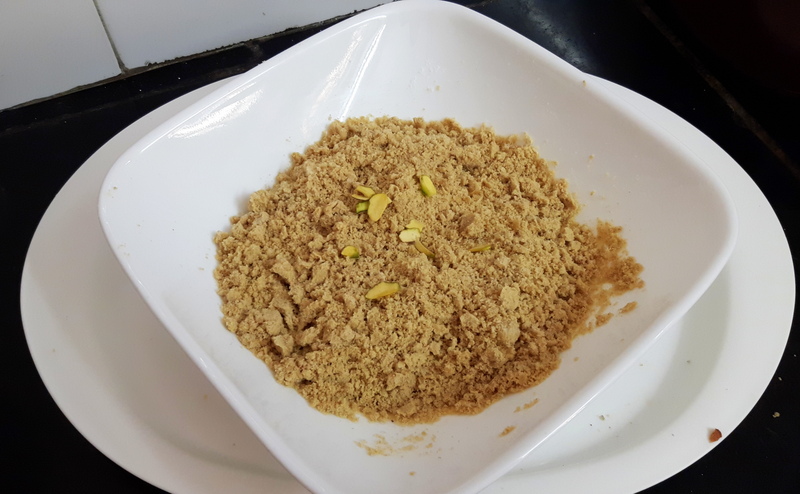 Cook until it comes to the halwa consistency; pour it on the greased plate, allow cooling and cut into rectangle or square shape as you wish. 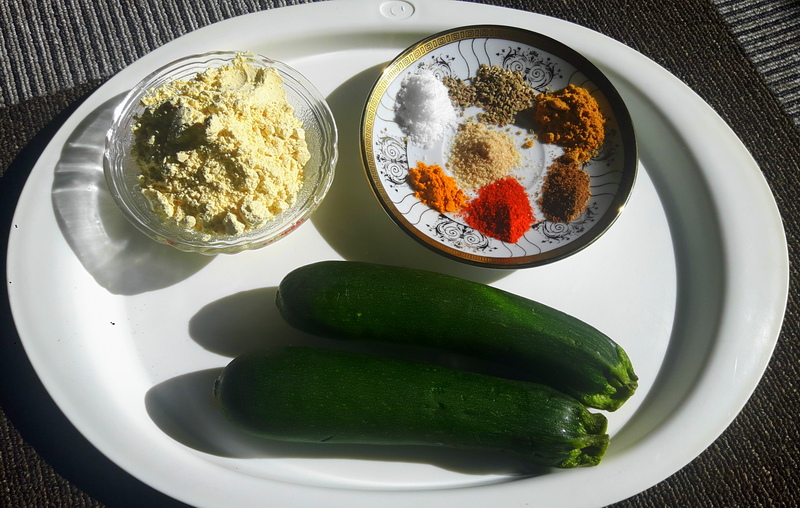 Keecha is ready to serve on the table after seasoning. 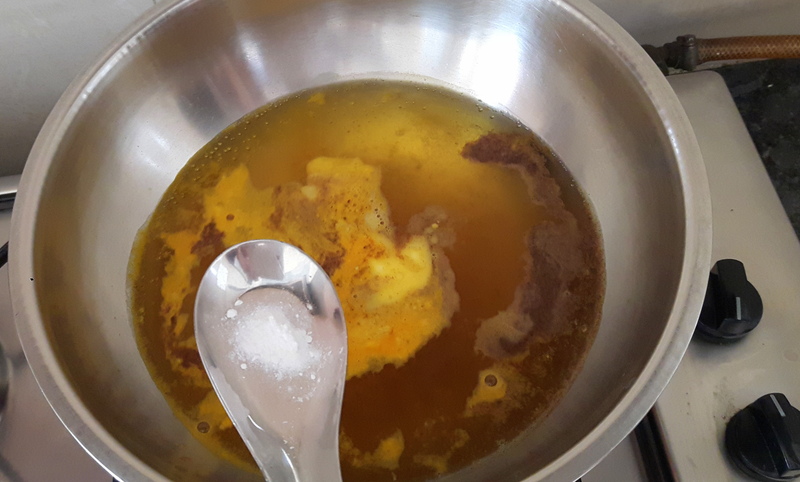 Take a fry pan and heat oil, when it starts to smoke add cumin, mustard seed and green chili. 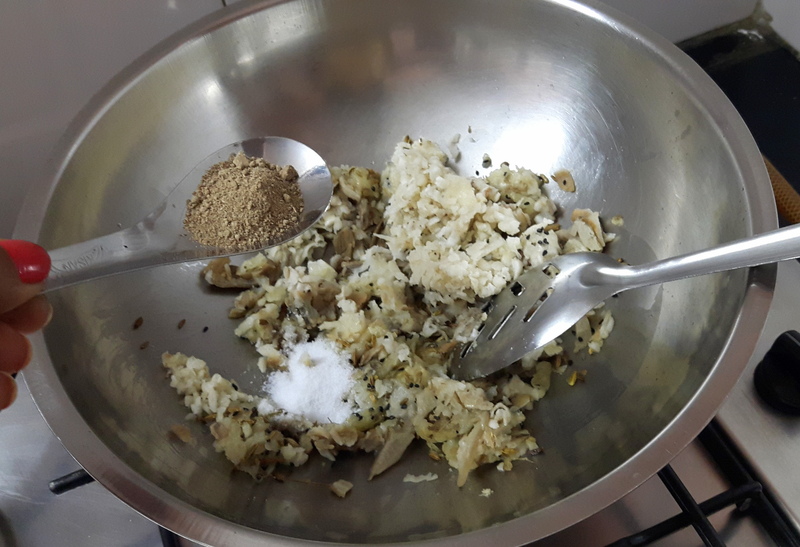 Sputter it for few seconds; pour this seasoning over the prepared kheecha. 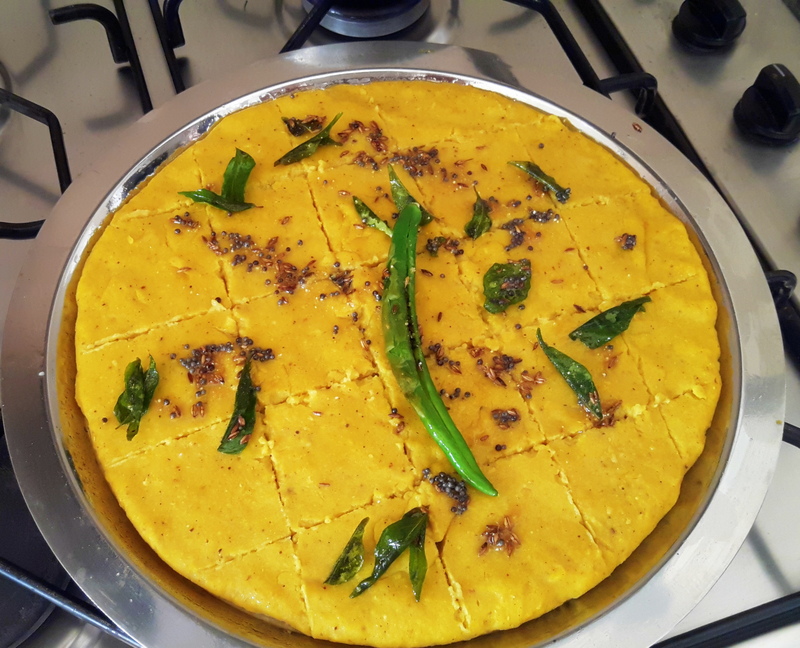 Transfer into platter and decorate with coriander Leaves. 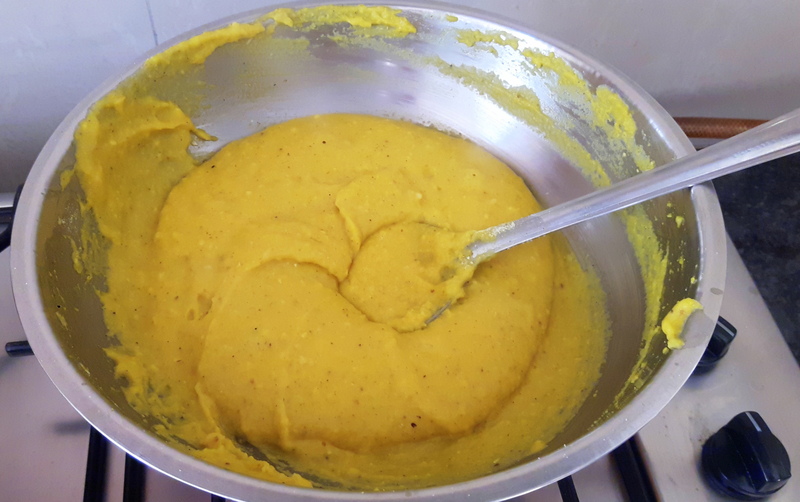 Now Makai ka kheecha (cornmeal porridge) is ready to serve. 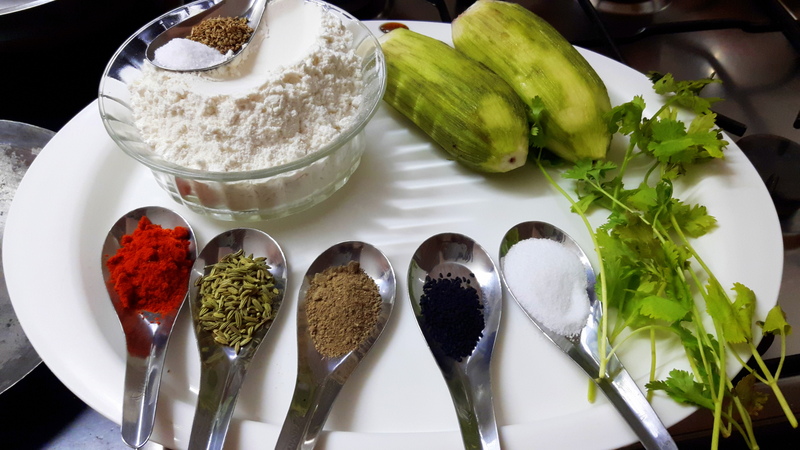 add cumin powder, garlic paste and meetha soda too. 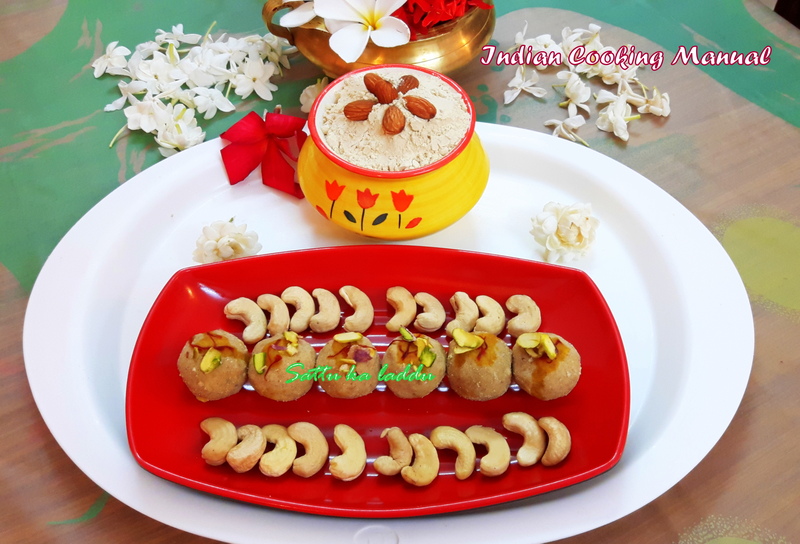 The buzz of the Deepawali festival is more on the sounds of the crackers than on the calendar, Indian prefers homemade cooked food and very fond of cooking food so I am uploading today raw banana kachori. 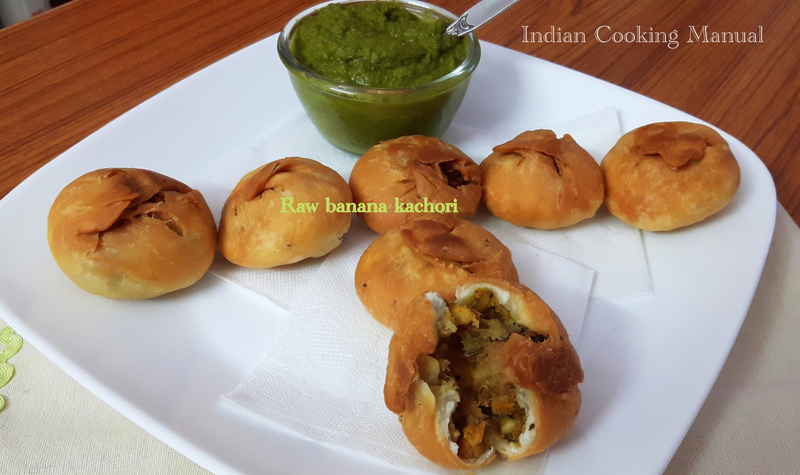 Raw banana kachori has amazing taste, your guest and family is sure to appreciate the recipe. There is no onion and garlic used in this recipe. 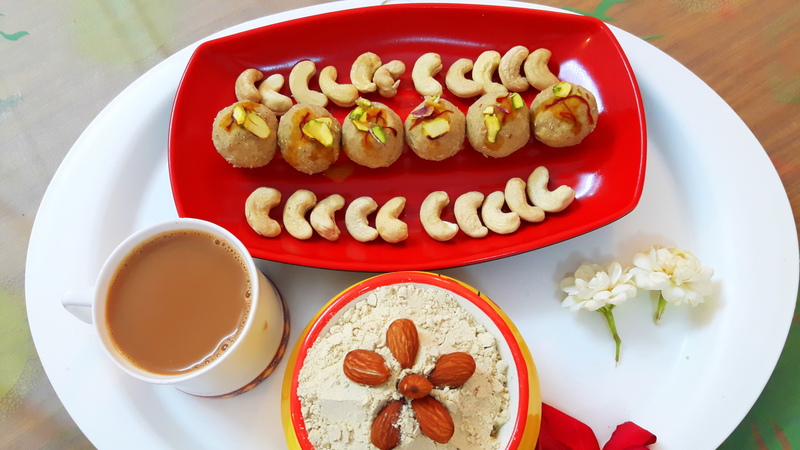 Enjoy the crunchy raw banana kachori with evening tea. 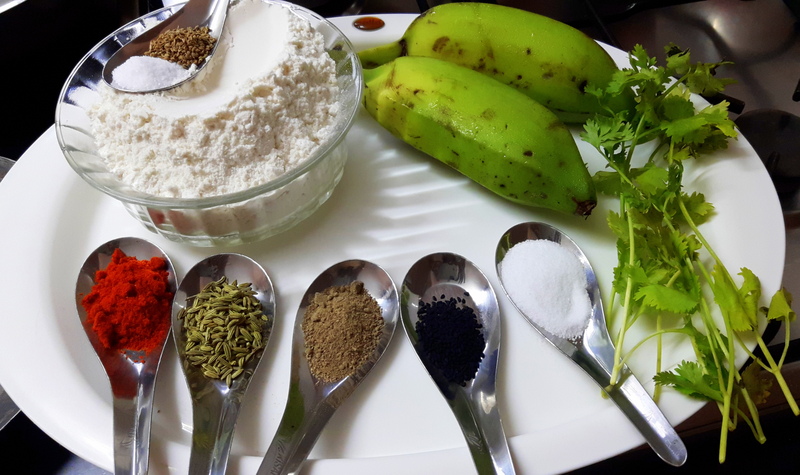 Don’t forget to apply oil in your hands, before peeling and chopping raw banana. Boil/ microwave the raw banana, Peel and grate the banana, keep aside. 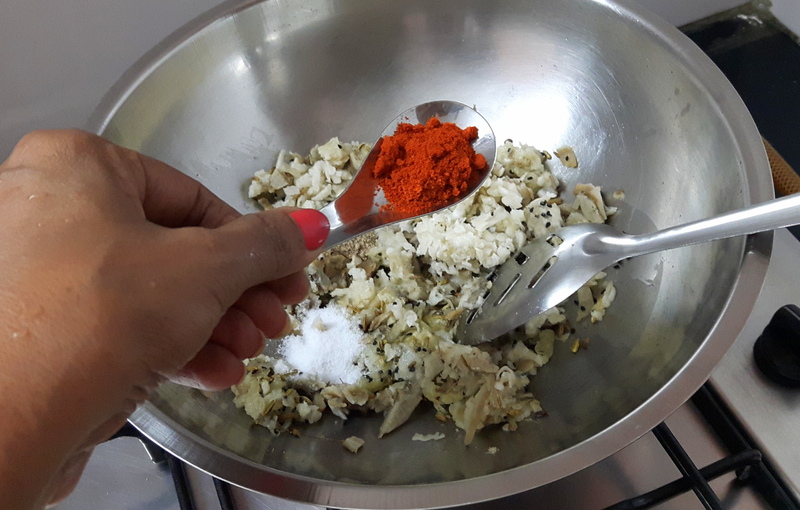 Take a wide vessel/food processor, Pour Maida, salt, Ajawin and ghee. Mix well by rubbing between palms. 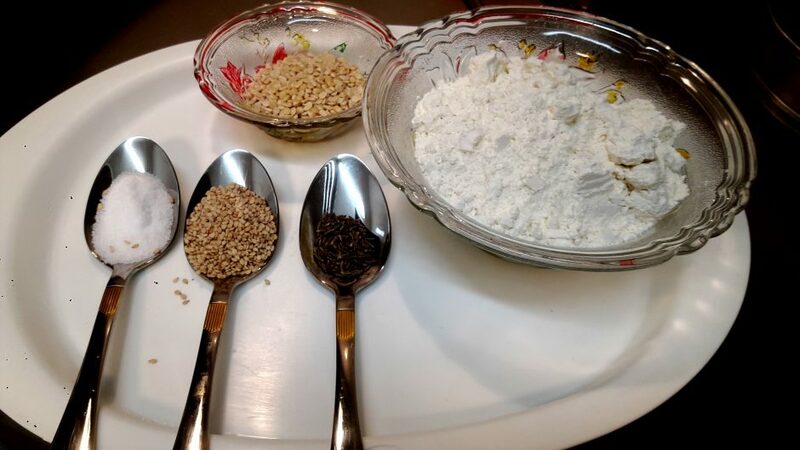 Mix well and prepare hard dough with the help of water. Keep aside for at least half an hour before use. 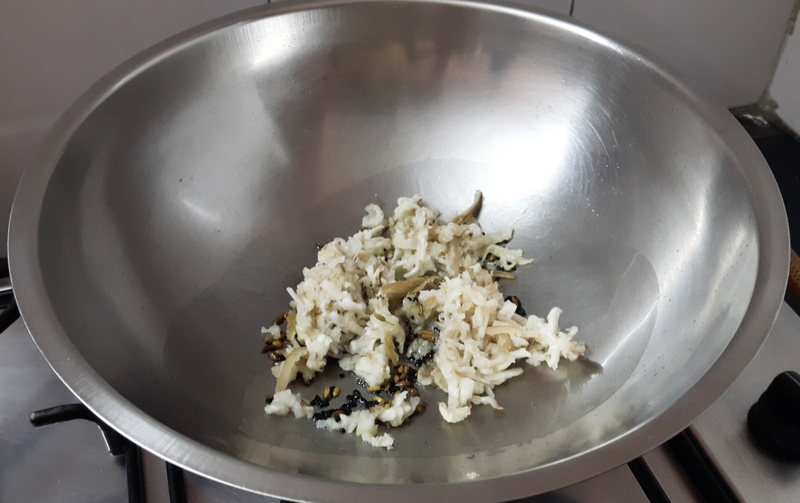 Take fry pan, put oil and heat, when it smokes, add fennel seeds and Kalongi wait till it sputters, add grated banana stir and fry (keep it stirring otherwise it may burn). 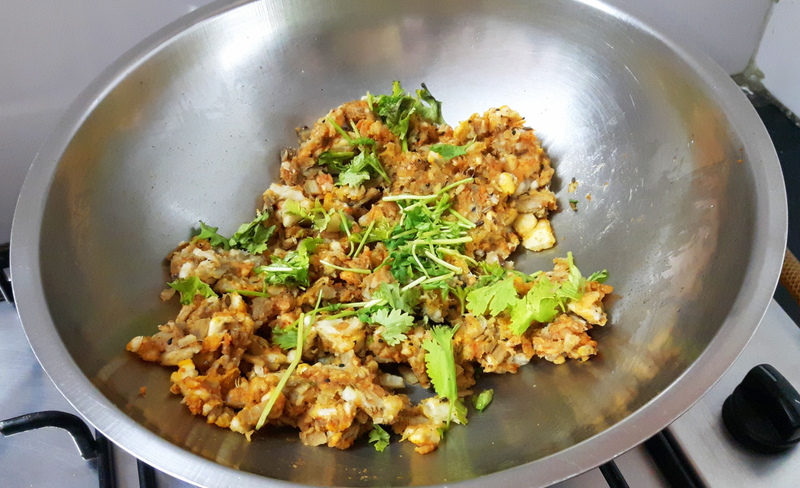 Add salt, chat masala, red chili powder and fresh coriander leaves; stir continuously and fry for couple of minutes. Put off the flame, now, stuffing is ready. Keep aside. Take dough, make lemon size balls. 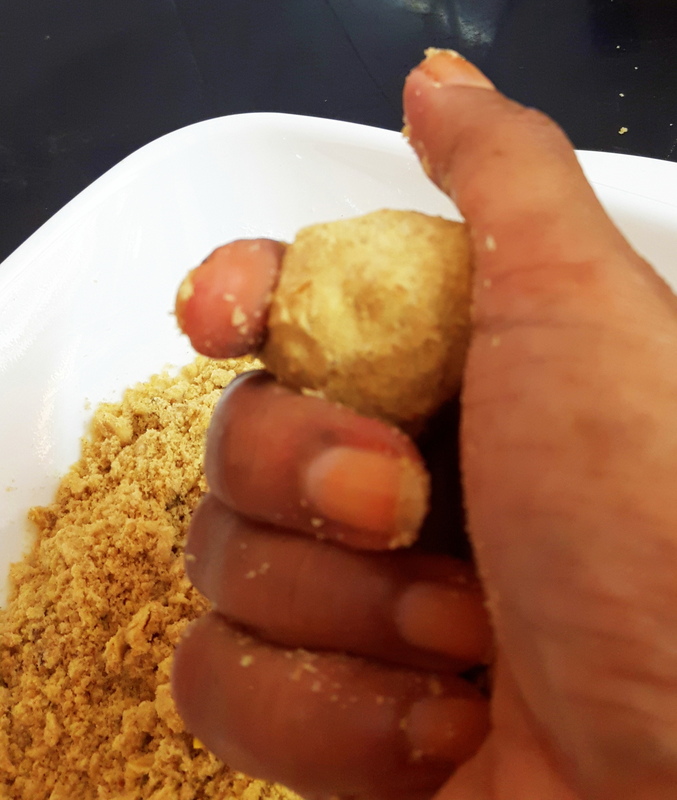 Flatten the edge of each ball with the help of finger, make 3’’ diameter circle (leaving centre little thicker than edge) and stuff 1 tablespoon stuffing in the centre. 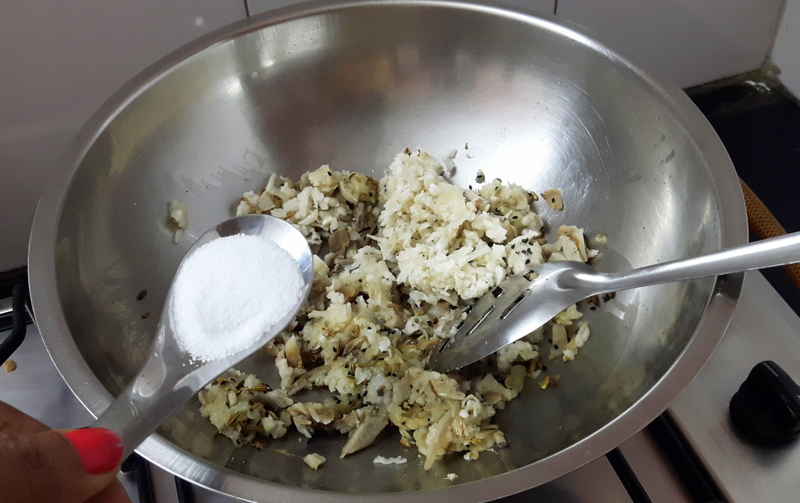 Pull the edge of dough to wrap the (stuffing) repeat with the rest. Make it round in shape. 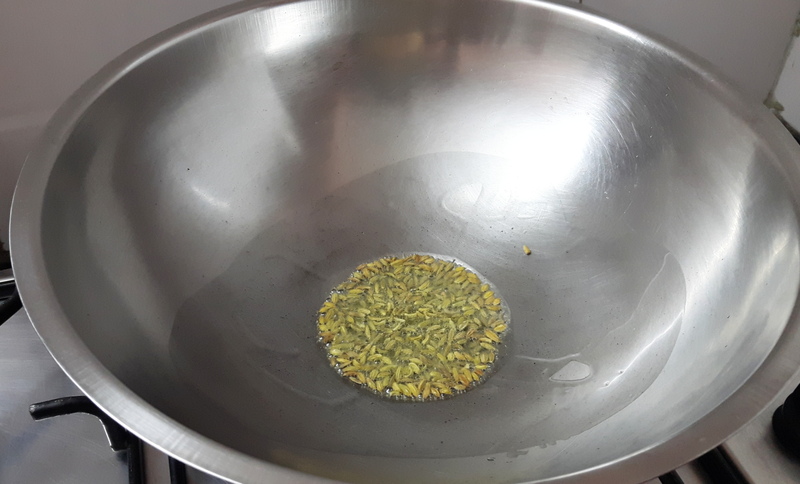 Heat oil in a fry pan on medium heat, to check if oil is ready put a small piece of dough in the oil, if it comes up slowly means temperature is ok, if not wait for a while and check again. 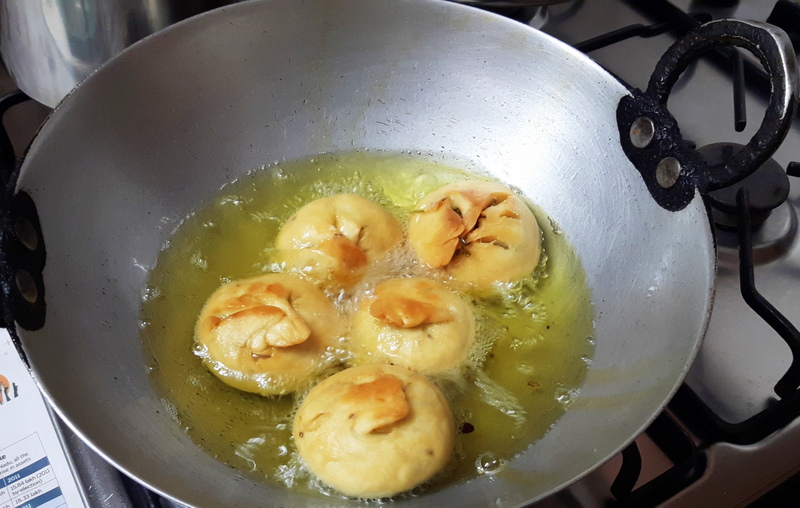 Deep fry the kachori on medium low heat. After they start to puff; slowly turn over. Fry till it becomes golden brown. 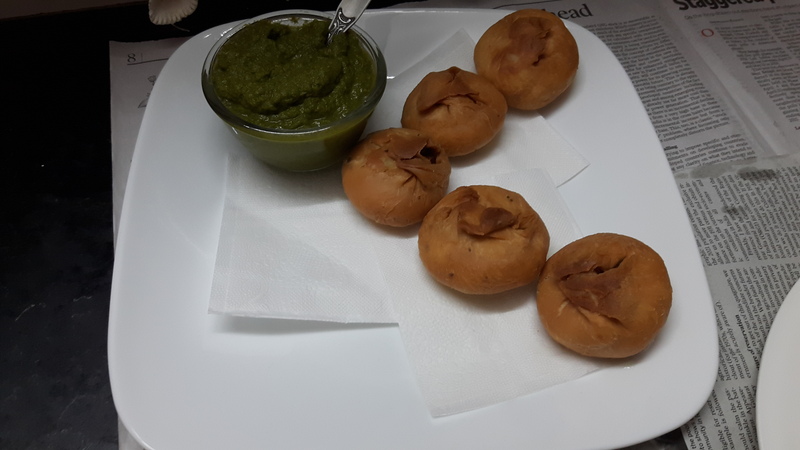 Now, mouth watering kachori is ready to eat with green chutney and sauth (tamarind chutney). 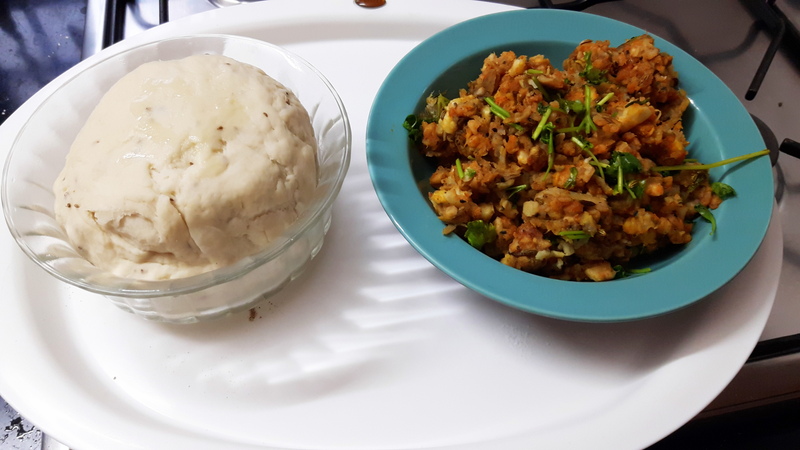 Note: if the kachori is fried on high heat, it will be soft. It will not be crunchy. 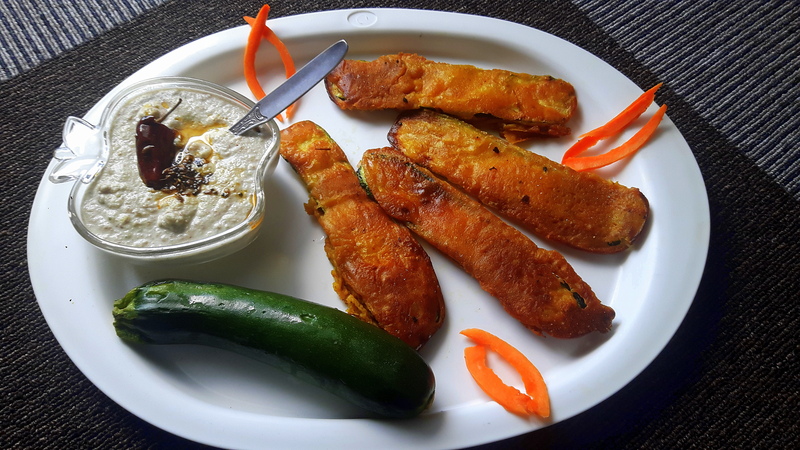 Zucchini is high in magnesium, fiber and vitamin, it is good to choose always medium in size. 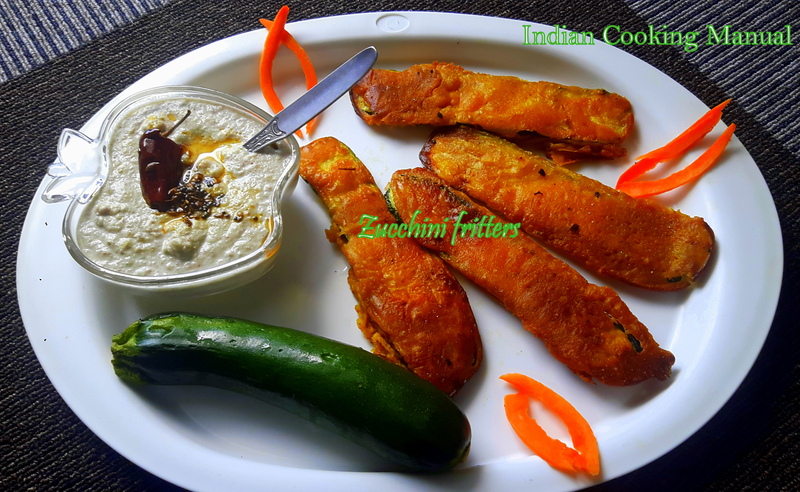 Prepare zucchini fritters for your family that are delicious and exciting, serve with raw peanut chutney/dip. 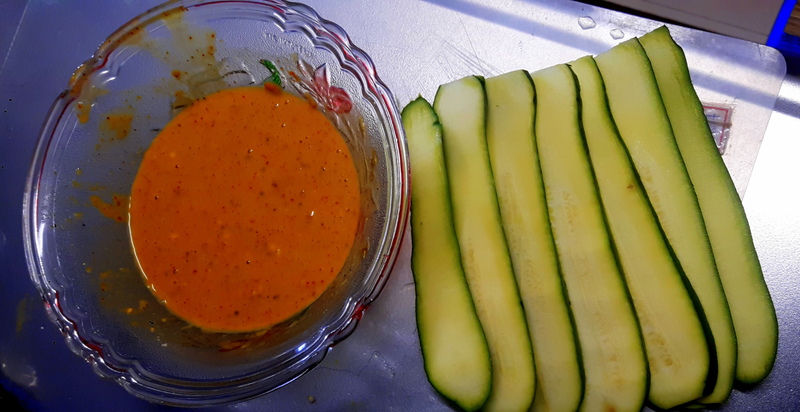 Take zucchini, slice into thin layer as shown in photo. Keep aside. Take a bowl. 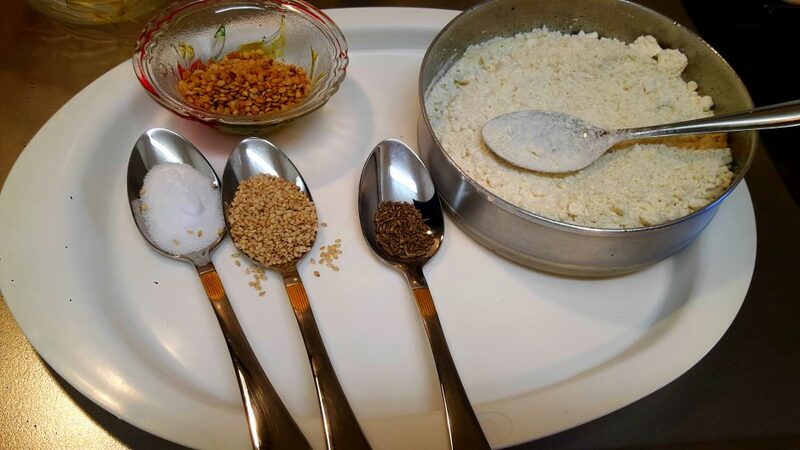 Put besan, salt and all ingredients; make a smooth batter with the help of water. 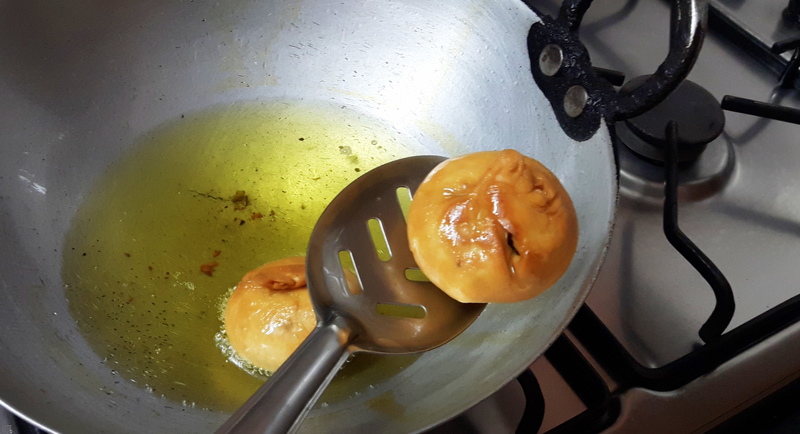 Take kadai (fry pan), heat oil in it. Let oil to smoke. 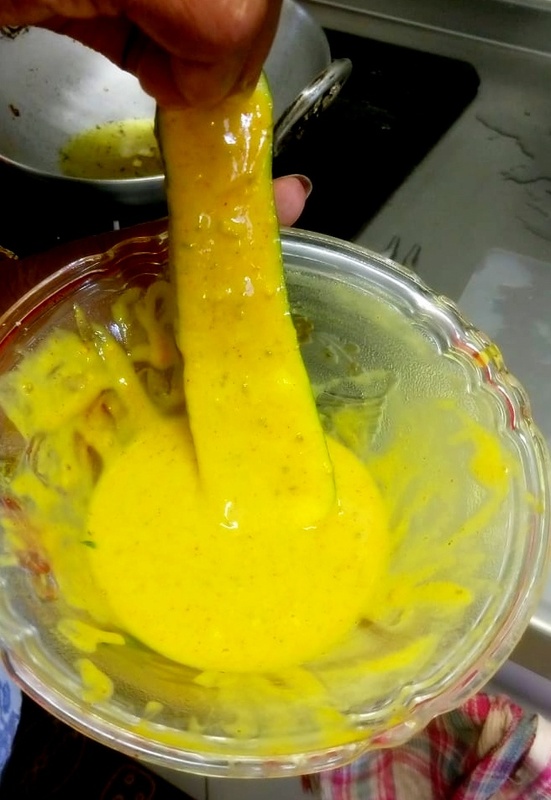 Pour a drop of batter into the oil. 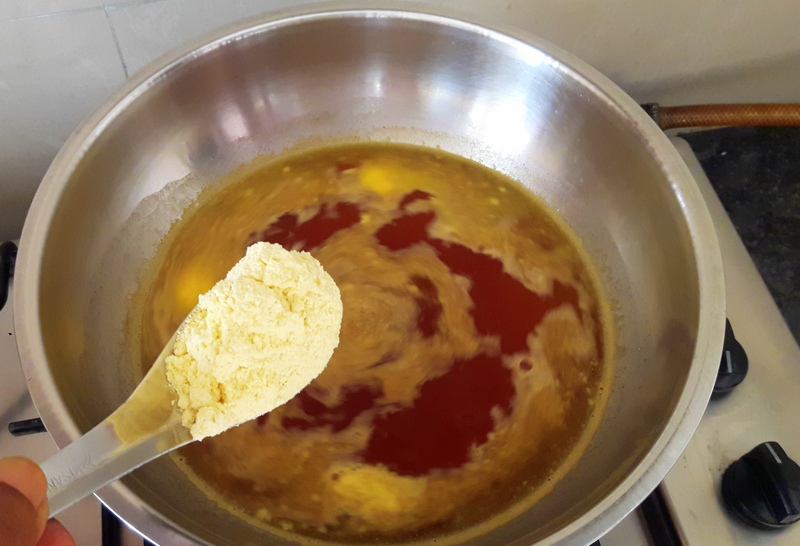 If batter comes up, it means right temperature of oil otherwise wait for a while and test again. 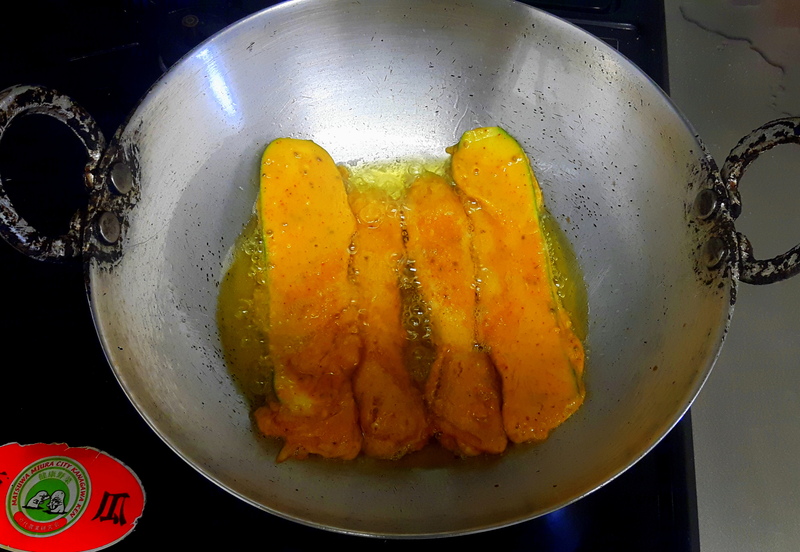 Deep fry all slices, when they start to come up, slowly turn over, fry till it becomes golden brown on both sides. 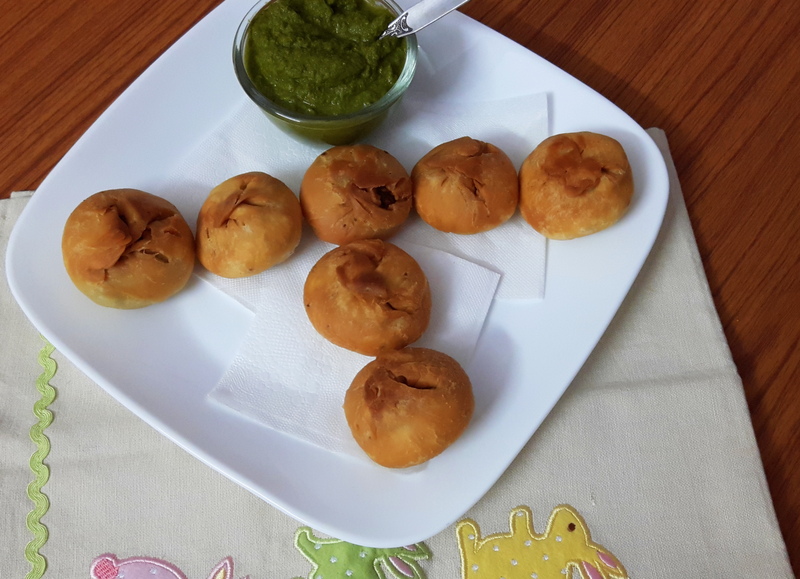 Remove the fritters from oil; serve hot with raw peanut chutney, tomato sauce and green chutney. 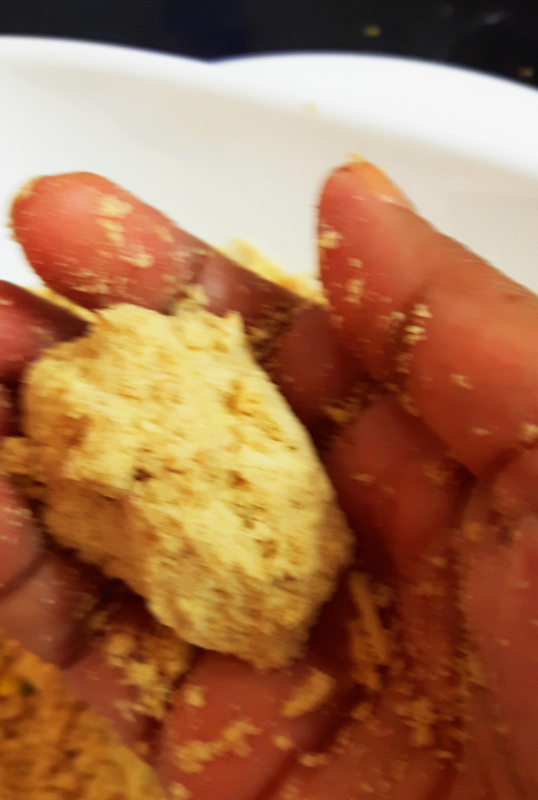 Since it is rich in proteins, sattu is beneficial for health and well being of growing kids. 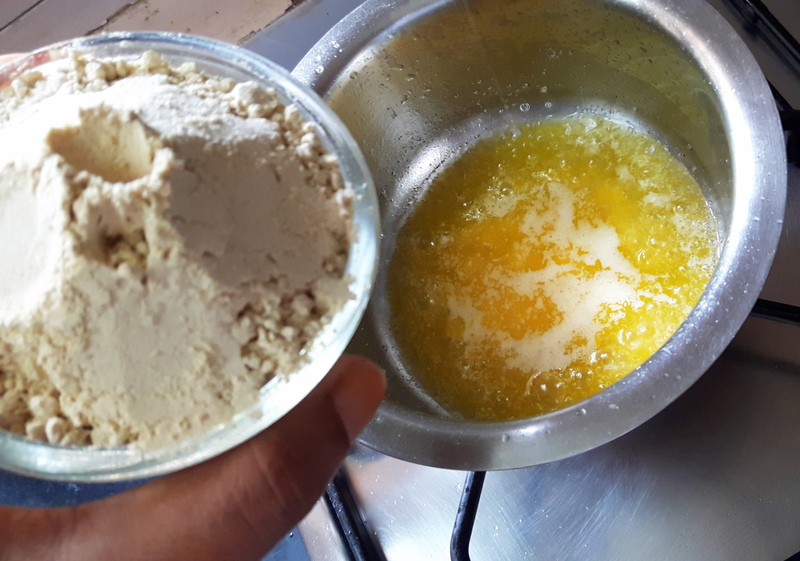 Sattu is prepared by one of the healthiest cooking method that is “roasting”; in this the nutrients value remains intact and can be stored for months. 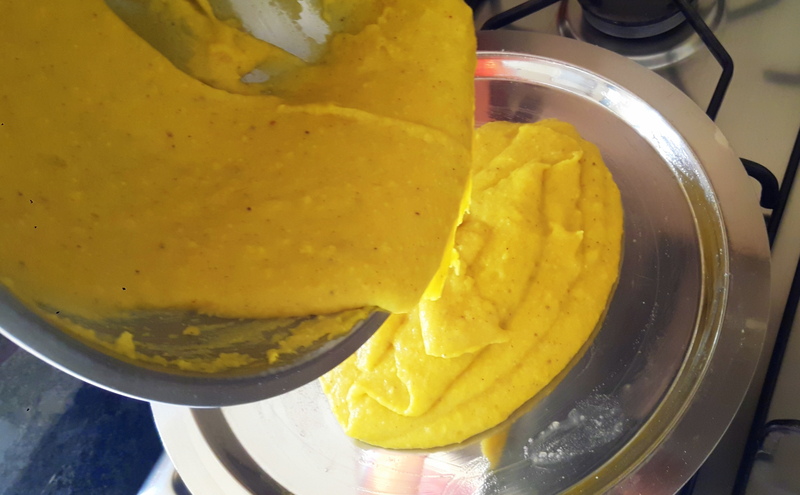 Making chana ka sattu is a time taking process; I used here readymade sattu flour from Bihar but if you don’t have, just grind the roasted chana dal to fine powder. Sieve it, use it. 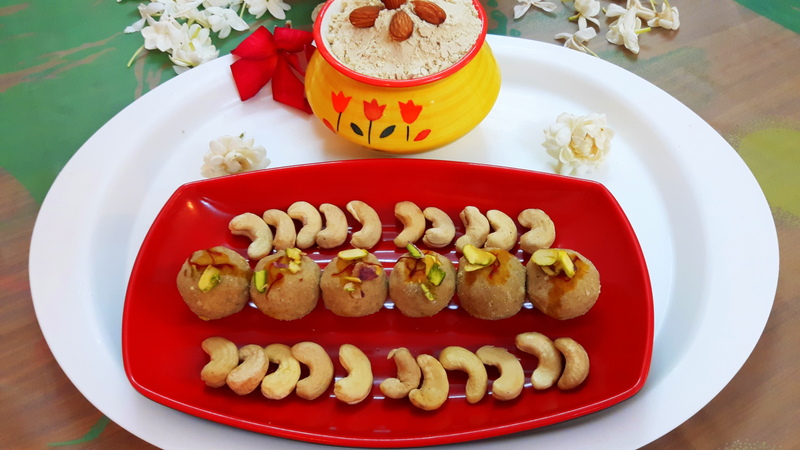 “Sattu laddu” is very easy to prepare it does not need to be cooked or fried, just add Indian spices, green cardamom and sugar powder or Jaggery and some dry fruits. 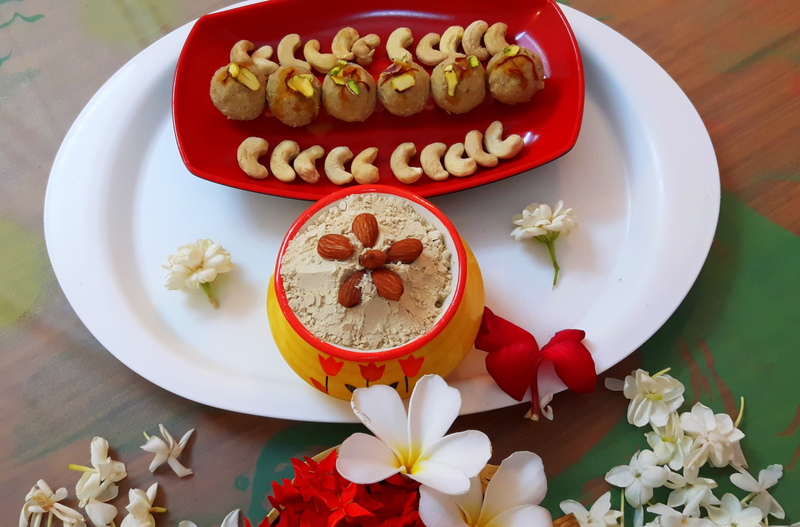 Green cardamom: 1- 6 no. Grind green cardamom to make powder, keep aside. 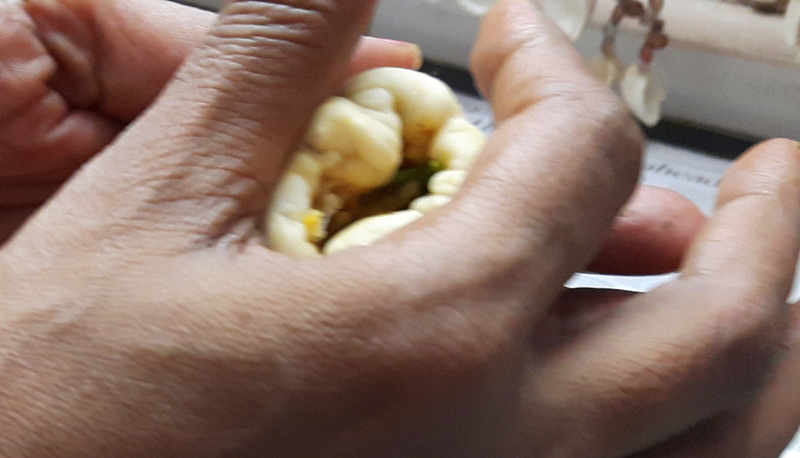 Slice dry fruits thinly, keep aside. 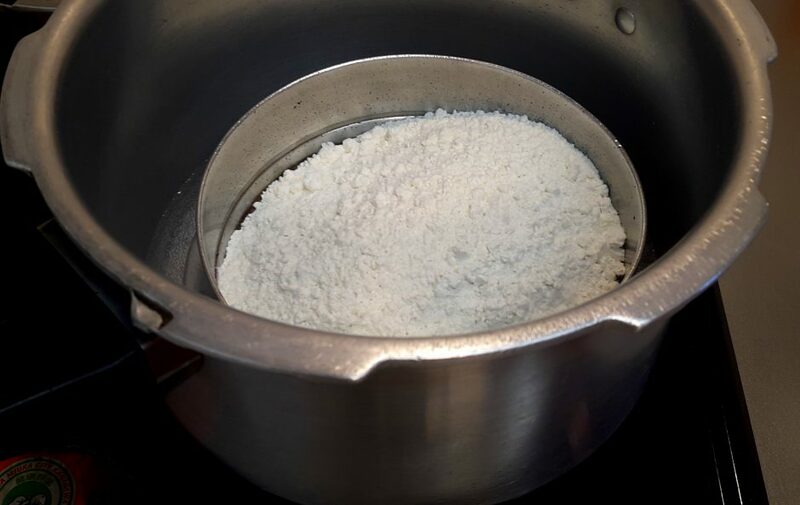 Grind sugar to make fine powder, keep aside. 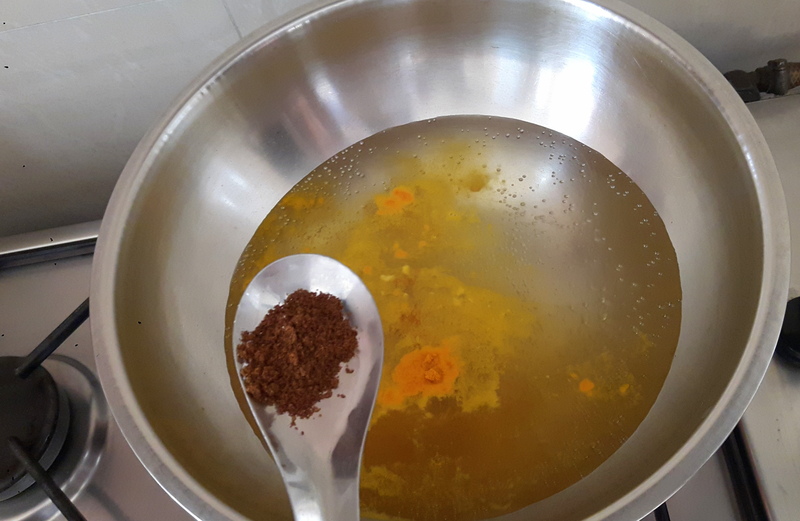 Soak the saffron into tablespoon milk for 10-15 minutes. 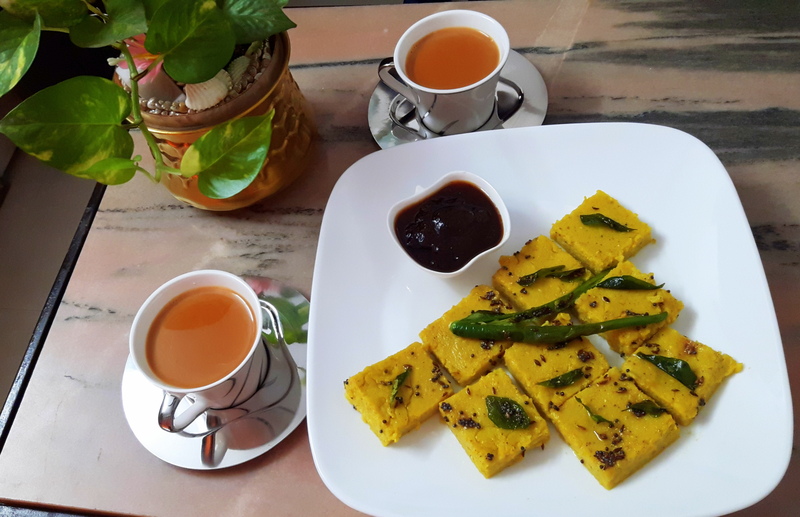 Take pan melt butter: add sattu, powder sugar, green cardamom powder and sliced dry fruits; and mix all things properly along with saffron milk. (Add more milk to reach the binding consistency if needed). 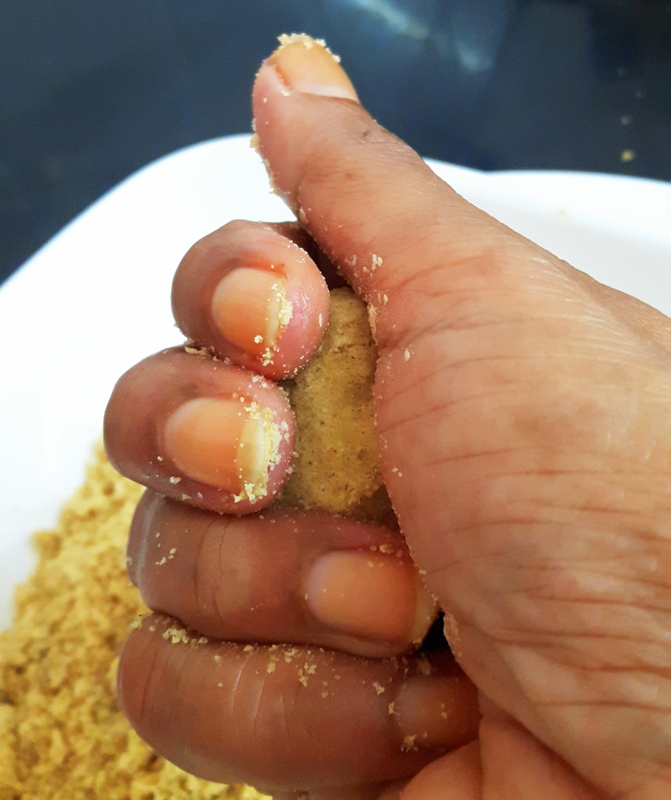 Take one handful mix; shape the mixture in round (laddu) by using your hands, depending upon size of laddu 10-12 laddu will be ready.